The first building over West End bridge was a cottage occupied by Mrs Fielding. Other shops and businesses in this block included Jas Smith's, dyers and cleaners, Libby Ellen's sweet shop, Eastwood, Astin, Sagar and Gledhill Solicitors, W. H. Cockcroft Architects (well before my time), and, of course, Crossley Westerman's photographers, later Alice Longstaff. 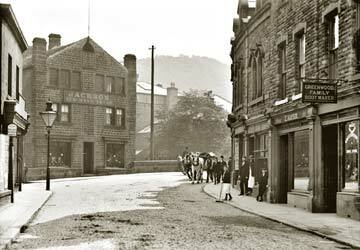 More from Lloyd on West End and Old Gate, Hebden Bridge, in the latest issue of Milltown Memories. Peter Thomas also relives the rock'n roll years at Nickie's Café where Hebden Bridge's first teddy boy hung out!